August 1, 2018 Valve has detailed what your $20 will get you when Artifact launches. Valve’s next game, Artifact, will launch November 28 on Steam for Windows, Mac, and Linux at a price of $19.99 USD, with iOS and Android versions to follow in 2019. Fans will be able to go hands on at PAX in Seattle, WA ahead of release, with that event running from August 31 through September 3. Yes, folks – we’re on the cusp of the release of a new game from Valve, and even if it’s not Half-Life 3 that’s a serious meme-killer. 280 cards will be available at launch. Your $20 purchase will get you a total of 228 cards, though, naturally, they won’t all be unique. You’ll get two base decks, each containing five heroes, nine items, and 40 additional cards. Ten booster packs will also be included, each containing 12 random cards, with each pack guaranteeing at least one rare. Further booster packs will be available for $2 each. Valve’s Wykrhm Reddy notes that today, August 1, is precisely seven years after Dota 2’s release – adjust your Valve new game doomsday calendar accordingly. More pertinently for PAX attendees, the game’s playable showing at PAX West will offer attendees swag, like signed art prints, and a pair of keys for free copies for showing up. You’ll be able to compete in a single-elimination gauntlet for the right to challenge an unnamed “champion” on the main stage. Whether or not you’re attending, the event should provide a lot of fresh footage and hands-on accounts of what to expect from Artifact. 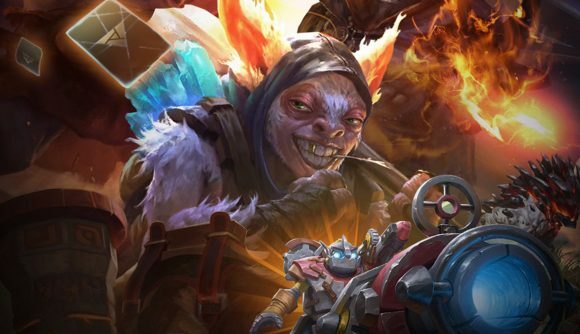 We knew the Artifact release date was set for this year, though we didn’t know precisely when or how much it would cost – only that it would not be free-to-play. Stick with us in the months ahead for more details on what to expect from Valve’s next title.